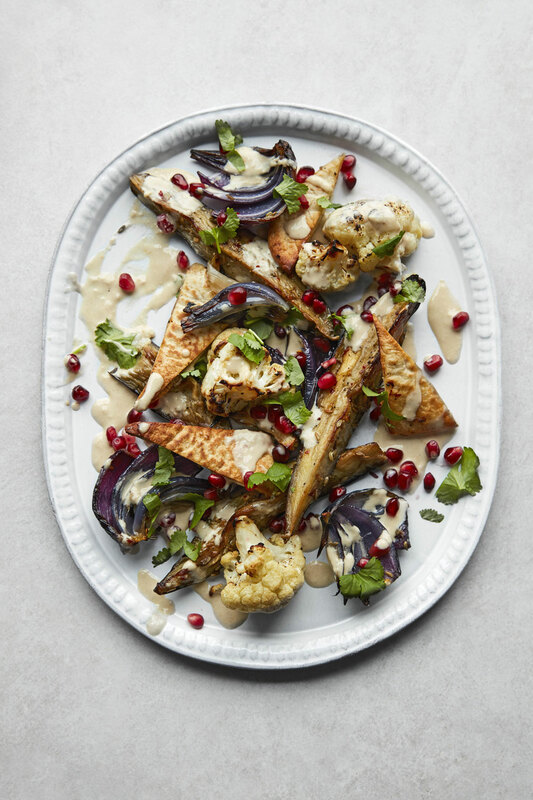 2Toss the aubergine and onion with 2 tbsp oil, the fennel seeds and chilli flakes; season. 3Spread on a parchment-lined baking tray and roast for 20 minutes. 4Toss the pitta and cauliflower with the remaining 1 tbsp oil; season. 5Stir the aubergine and onions, then nestle the pitta and cauliflower florets in between. 6Turn the oven up to 220°C, gas mark 7, and roast for another 20 minutes, until golden. 7For the dressing, mix the tahini with the orange juice, garlic and 3-5 tbsp warm water until smooth and the consistency of double cream. 8Arrange the vegetables and pitta over a large serving plate, spoon over the tahini dressing, and scatter with the coriander and pomegranate before serving.